A grommet in the left-front pocket, handy for dispensing flagging. Two right-front breast pockets for tapes, clinos, or compasses. Large, zippered back pocket, accessible from both sides. Back pouch with adjustable snap closures and grommets for fastening gear. Three slots for pens and pencils. One slot for a rule. Neckline grommets to secure instruments with lanyards. 10.10-ounce cotton duck canvas, in green, red, orange, and blue. 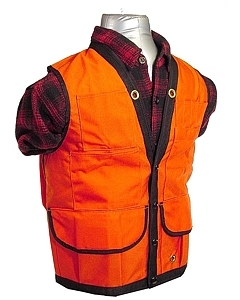 1000 Denier Cordura vest is available in orange and green. High visibility Orange and Lime Green only available in 100% polyester.